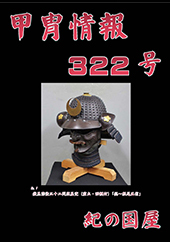 busines is buying and selling of Samurai-goods. The number exceeds 100. It is Samurai goods chosen by the experience and knowledge. This page is English version. Company name : KINOKUNIYA Inc. If you are interested in our items, please contact us by e-mail. After confirmation such as having stock or not, shipping cost, If the purchase is decided, We will inform our bank account number. So please send money to the account number. After receipt of money confirmation, We will send items by EMS. And We will inform you EMS number. Anyway please refer for any questions by e-mail willingly. The display is Japanese yen. Shipping cost is another.